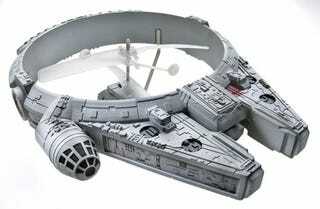 It's not the full thing, it doesn't fly on anti-gravity engines, and it doesn't include lots of wookie hair, but I definitely like this 11 by 8-inch Millennium Falcon released at Toy Fair. Why? Because the damn thing FLIES. The remote-controlled Falcon comes with a charging controller, all for $50.